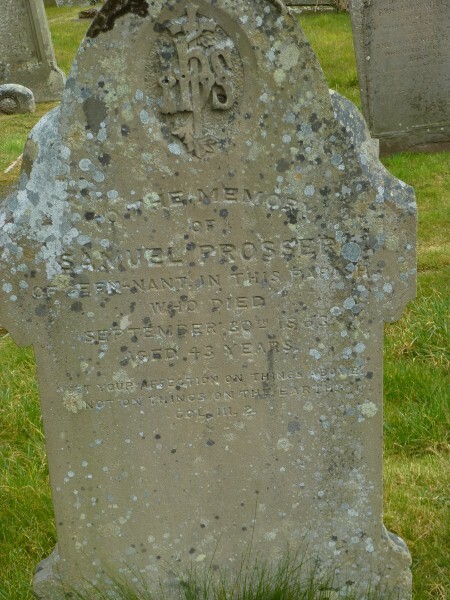 William Prosser (c.1722-22 December 1807) and Phoebe Davies (c.1742-1826, baptised to David Davies and Mary ? December 8 1745) were married at Llanigon on February 15 1769. (Phoebe had witnessed a marriage there of a Mary Davies to a James Price on January 20 1769). Their £100 marriage bond dated the 24th June 1768 was agreed between William Prosser of Llanigon and his bondsman Alexander Lewis of the town of Brecon. William was described as a Yeoman. Alexander Lewis was probably the Brecon butcher buried in 1800 who appears in Parish Records along with two wives and children. 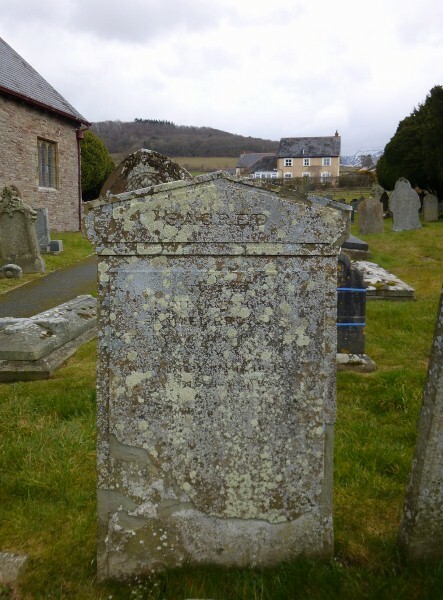 William Prosser of the parish of Talgarth was probably the person buried in Llanigon on December 25 1807 aged 85 while Phoebe was buried in Talgarth on November 19 1826 aged 84. 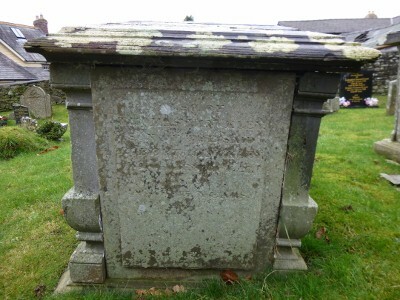 William was buried in the same grave as John Delahay (c.1653-9 August 1708) and Jane Prosser (1678-1 January 1767). Jane Prosser (1773-1836) (bap. June 2 1773) who married Robert Hinckley (1769-1831) of Pont-y-wal on March 2 1794 at Talgarth. 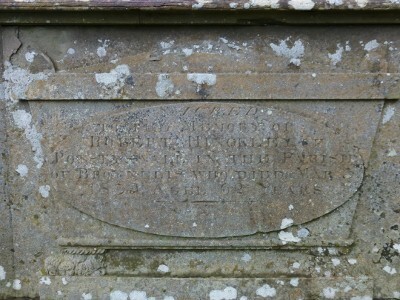 Thomas Hinckley (1795-1839) married Jennet Jones (1774-1836) on February 5 1810 at Brecon St David. His daughter Sarah Hinckley (1816-1858) was baptised to Thomas and Jane Hinckley of Tregunter, Talgarth on September 8 1816 and married Evan Beavan (c.1803-1881), ironmonger of Brecon, in Talgarth on October 31 1837. They had Thomas Hinckley Beavan (1838-1923) baptised on August 19 1838 who became Rector of Bronllys and never married and William Christopher Beavan (1843-1847). William Hinckley (1797-1863). At Pontywall in 1851 and 1861. 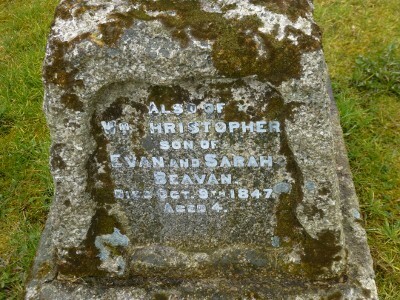 Died February 20 1863. Samson Hinckley (1799-1860). At Pontywall in 1851. On BMD as Samuel Hinckley and Talgarth burial register as Samson Hinckley of 'The Lodge', aged 60, interred April 23 (or possibly 25) 1860. GLASBURY - MAN FOUND DROWNED - As a man from this village was going to his work, a little after six o'clock yesterday (Friday) morning week, he observed the body of a man in the river Hynfi*, about eight yards from its confluence with the Wye. He immediately gave the alarm, and with assistance the body was soon got out, when it was foud to be the body of Mr. Samuel Hinckley, of the Lodge, near Talgarth. How he could have got into the water in that place is quite enveloped in mystery, as he had been to Hay, and was seen returning home within a short distance from the spot, where he must have gone off the turnpike road. Several persons saw him between 9 and 10 o'clock on Thursday night; and for him to have got to the place where the body was found, he must have gone over a bank 10 or 12 feet high, and along a flat piece of ground 6 or 8 yards before reaching the water, the road-side at that place being protected by strong posts and rails. An inquest was held at the Six Bells on the same day, before James Williams, Esq., Coroner, and a respectable jury, who returned a verdict of "Found drowned." After the inquest was over, the body was removed home by his friends. It may be stated that after he was gout out of the river a £5 note, six shillings and four pence, and some papers were found in his pockets. (Hereford Times 28 April 1860). * Actually the river Llynfi. John Hinckley (1801-1863). A farm bailiff for Sir Joseph Bailey of Glanusk Park, living at Glanusk farm in 1861. Unmarried. Ann Jenkins (1828-1916) who married lawyer John Williams (c.1829- ) and had: Emily Williams (1859- ) unmarried with her mother in 1911; George Hyatt Williams (1861-1935) solicitor and Town Clerk of Brecon, unmarried in 1911; Alicia Jane Williams (1862-1951) unmarried hospital trained nurse, companion to Lucy S Griffith in Dolgellau in 1911; Edith Mary Williams (1864- ) hospital trained nurse, unmarried with mother in 1911; John H Williams (1867- ); Thomas D Williams (1871- ) clerk for a manufacturing chemists in 1911 married to Leonora Sarah Hancock (1878- born Cardiff) and living in Sydenham in 1911. They had: Hyatt Todd Williams (1905-1969) born in Cape Town, died Goodwood Park, South Australia who emigrated to Adelaide from London on January 11 1923 on the SS Benalla giving his last address as Ferndale, Combe Martin, Devon; Leonard Hinckley Williams (1907-1984) born in Cape Town, died South Glamorgan; Jane G Williams (1910- ) born Sydenham. George Hinckley (1806-1872). At Pontywall in 1851 and 1861 and Bronllys village in 1871 with niece Anne Hinckley as housekeeper. James Hinckley (1813 - ) married Mary Morgan at Crickhowel on November 2 1837. Daughter of James and Mary, Mary Anne Hinckley (1838-1840) baptised at Llangattock in 1838. 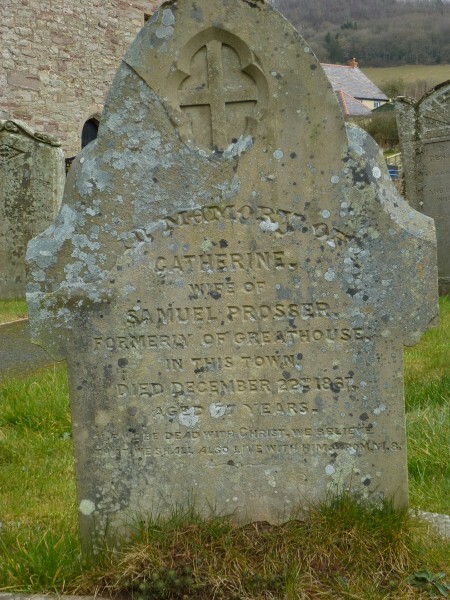 Catherine Prosser (1776-1860) Catherine was baptised to William and Phoebe Prosser at Llanigon in 1776 and had an illegitimate child William according to William Prosser's will. She married John Thomas in 1802. See Thomas family of Oakfield, Llanfihangel Talyllyn, Breconshire for their descendants. PROSSER. - Feb. 16, at Red House, Talgarth, aged Mr Samuel Prosser, for upwards of fifty years respectable that place. (Hereford Times 24 February 1855). He married Catherine Price (1790-1867) born Clifford, Herefordshire. Anne Prosser (1810-1868) In the 1861 census, she was an unmarried 50-year-old grocer and subpostmistress in Talgarth. Catherine Prosser (1813-1888). She married widower John Davies, a farmer born in Builth, on April 28 1851. He had at least four children from his previous marriage and the couple then had William Benjamin Davies (1853-1877). They moved to Dinmore, Herefordshire. 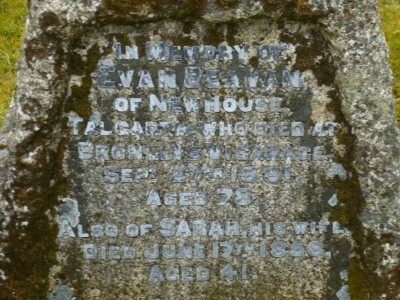 She was buried in Talgarth in 1888. TALGARTH PETTY SESSIONS, Dec 5th (Before H. Allen and Evan Bowen, Esqrs.) - Thomas Prosser, farmer of Talgarth, was summoned by Mary Jenkins, of the parish of Llandefally, to show cause why he should not contribute to the support of her illegitimate child, the honour of the parentage of which she sought to fix on him. Defendant did not appear, but corroborative evidence having been given, the Bench ordered a payment of 1s. 6d. per week only, as this was the second time the same parties had sought the magistrates' decision. (Hereford Journal 12 December 1855). Catherine Price Prosser (1860-1923, died Llanfyllin) who married Alfred Walton Trevelyan Harwood (1860-1901, born Deptford, Kent, died Merthyr Tydfil) and had: Alfred Thomas Prosser Harwood (1878-1960, born Dowlais, Glamorgan); William James Price Harwood (1880 - , born Dowlais, Glamorgan); Lilian Beatrice Harwood (1883 - , born Breconshire). DAVIES-HARWOOD. In the presence of a crowded congregation, a pretty wedding took place on Wednesday at St. John's Parish Church, Dowlais, the contracting parties being the Rev. Lewis John Davies, curate of Bagillt, Flintshire, and Miss Lilian Beatrice Harwood, of Ivydene Villa, Pant, Dowlais. The marriage ceremony was performed by the Rev. E. R. Davies (brother of the bridegroom), curate of the Welsh Church, Dowlais, and assisted by the Rev. W. H. Davies, curate of St. Michael's, Dowlais, and the Rev. J. D. Hughes. curate of Cogan, Penarth. The bride was given away by her mother, while the Rev. T. E. Meurig Davies, curate of Llandovery, acted as best man. (Merthyr Express 12 June 1909). Alfred Thomas Prosser Harwood married Clara Louisa Wallace (1881-1954, born Holborn, London) in Bristol on 22 December 1900 and had Leslie Thomas Prosser Harwood (14 Jul 1903-1996; born Bristol, died Rushcliffe, Nottinghamshire) who married Barbara J Emery in 1946. Prosser Harwood, M.A., to the Living of St.
cession of the Reverend Basil Simpson Ainley, B.A (London Gazette 20 January 1942. Phoebe Prosser (1789-?1850) (bap. May 1792) who married a John Jones at Talgarth in 1808.